Fire hydrant system documentation is established to recording information & activities concern fire hydrant installation for fire safety at various locations. Fire hydrant system documentation preparation, maintain and update records and document for conducting record & information from various department about fire safety and fire hydrant condition, update and concern requirements of maintenance to maintain safety in each department, locations and ensure that fire hydrant system is properly work any time in case incident occur. The system is installed in the various department and locations for managing fire safety in workplaces as per reviews and identify possibilities of fire, fire hydrant system is whole system circuit that needs to checking frequently or as per checking period defined by management but its important that during the month at least two time verification and checking is needs to ensure that whole system is working properly and its concern peoples should also proper trained and mock are conducting as needs. 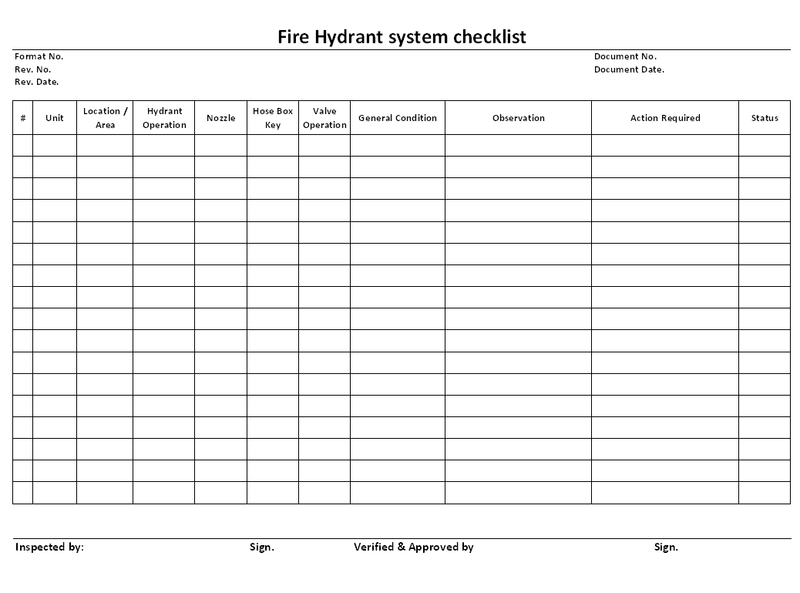 Fire hydrant system checklist format used in internal management system audit / safety audit at various locations and department of workplaces, the system of fire hydrant management is conduct to auditing each fire hydrant and its system to identify internal requirement concern safety against fire probability are higher at places. The documentation is prepared, maintain and update as per standards system and management for safety concern.